Land at Cynheidre by kind invitation of Tegwen Devichand. 54 acres of mostly unimproved pasture, woodland and a natural lake. Meet on the roadside beyond the railway bridge just past the entrance to the Llanelli and Mynydd Mawr Heritage Railway site, SN495073, 2:00pm. 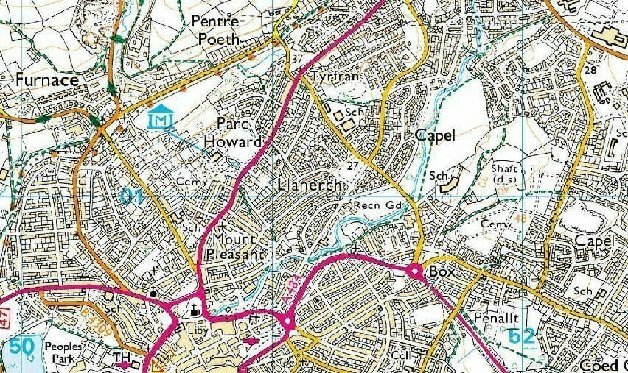 Llanerch Hall is immediately to the left of the 'R' in 'Recn Gd' in the centre of the map below. From town take the Cross Hands road (A476), pass Parc Howard on the left and continue for another 250m. Turn right opposite the Dimpath pub (Tyrfran on map). Turn right at the first mini roundabout and you come to the 'Y' junction where the hall is on the south side ('R' of 'Recn Gd'). From the Cross Hands direction, pass the Felinfoel Brewery and then the filling station, both on the left, continue along the straight to the top of the hill, to the Dimpath pub (on the right). Turn left opposite the Dimpath (Tyrfran on map). Turn right at the first mini roundabout and you come to the 'Y' junction where the hall is on the south side ('R' of 'Recn Gd'). There is plenty of parking space near the hall.